Bob and I cannot get enough of exploring the wilderness in Algonquin Provincial Park here in Ontario. 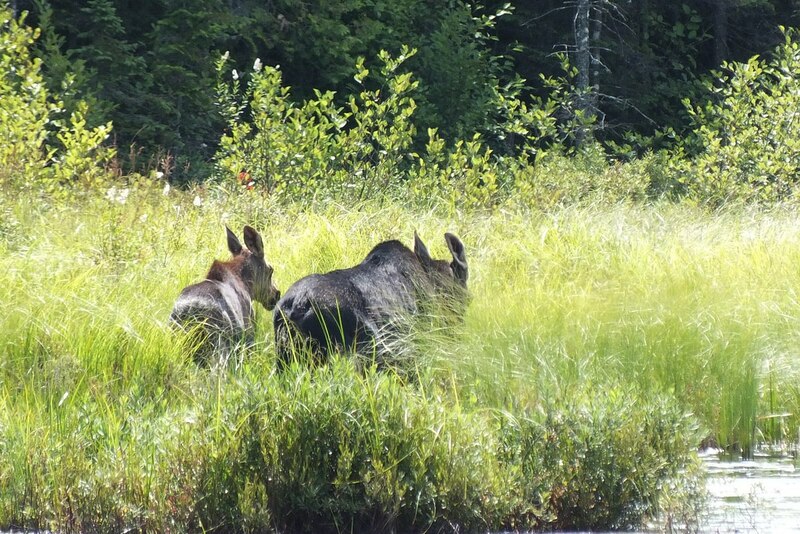 It was while hiking the Mizzy Lake Trail that we came upon a Moose cow and her calf standing in the muddy water at one end of a lake. I think we have instilled a similar love of nature in our children because our youngest son just spent his honeymoon in the Park and put himself and his bride to the test hiking the Mizzy Lake Trail, one of the most difficult and longest trails in that protected wilderness area. 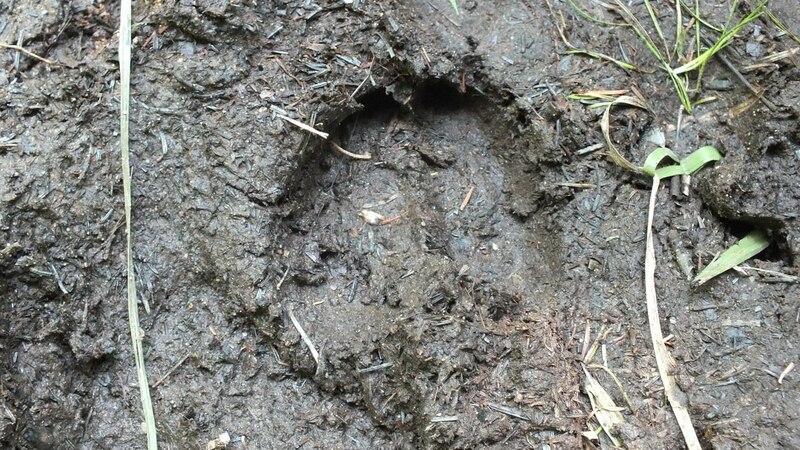 They had great luck seeing Moose along the trail, so Bob and I wanted to give it a go, never having hiked that trail before. We set foot on the Mizzy Lake Trail at 8:45 a.m., starting at the trailhead just off Highway 60 on Arowhon Road. It was shortly after our modest picnic lunch, about 1:30 p.m., when we came to March Hare Lake. 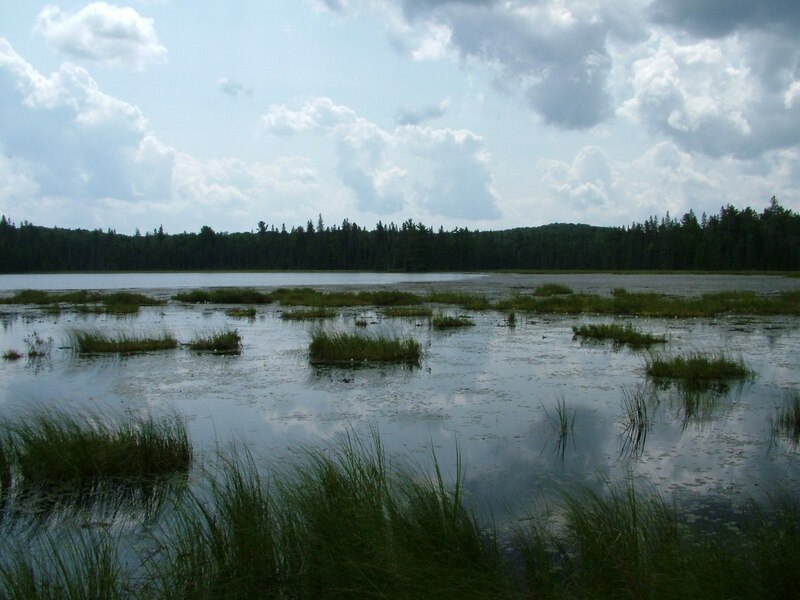 It is one of the nine lakes and ponds visited by the 11-kilometre trail. A massive pine tree dominated the point at the north end of the lake, and the open area beneath that tree afforded us an excellent view looking south over the calm waters. March Hare Lake is a boggy, shallow lake making it ideal for wildlife because its waters are rich in aquatic plants and insect life that are able to thrive there. As Bob stood at the shore, he spotted minnows in the water, frogs biding their time in the reeds, and a couple of ducks sliding by silently in the distance. 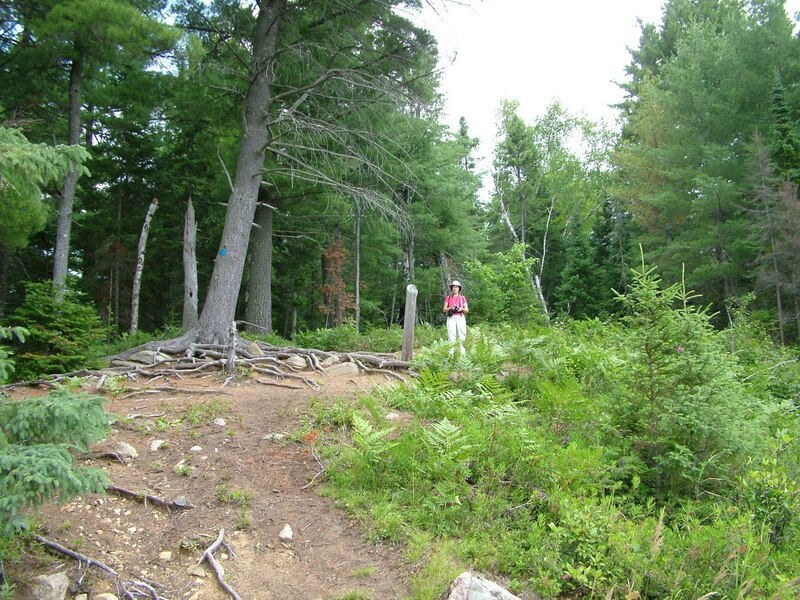 If you were to take a look at the map for the Mizzy Lake Trail, you would see that Bob and I were a good three-quarters of the way around that circuitous route that brings a hiker back to the trailhead. We had just about given up hope of spotting any Moose. From the windblown point, the trail circles north then eventually comes back to the eastern side of the lake. As we picked our way over tree roots and rocks, Bob happened to glance to his right through the brush along the shore. 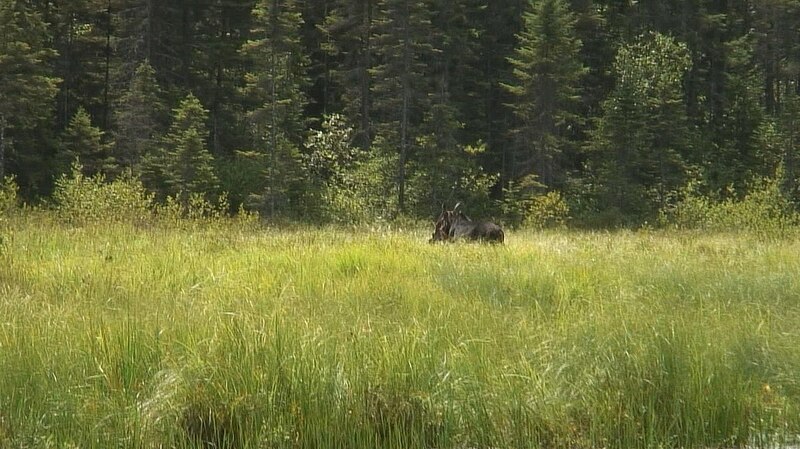 If not for the black ears of the cow moose poking up out of the reeds, we would have missed seeing her altogether. The problem was that a lot of underbrush was blocking our view from that location on the shore, and the Moose cow kept lowering her head out of sight, so Bob moved further along the trail in search of a better spot with an unobstructed view. I didn’t know how far ahead Bob had gone, but I stayed put. 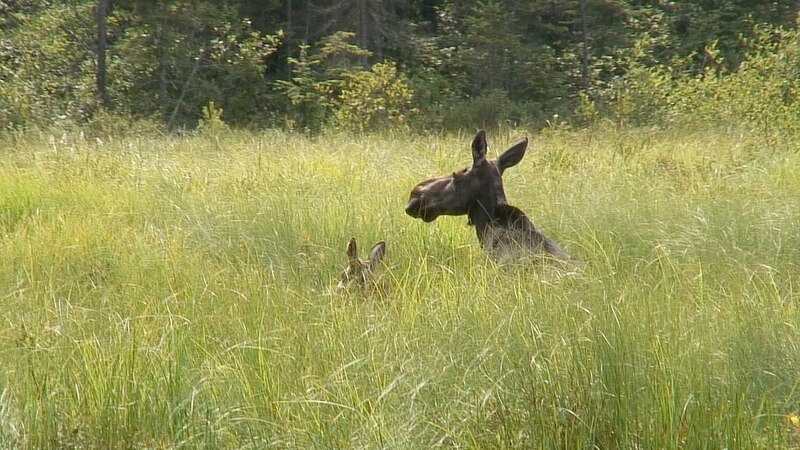 When the Moose cow nudged her way forward through the long marsh grasses, I could see that she was accompanied by a young Calf. 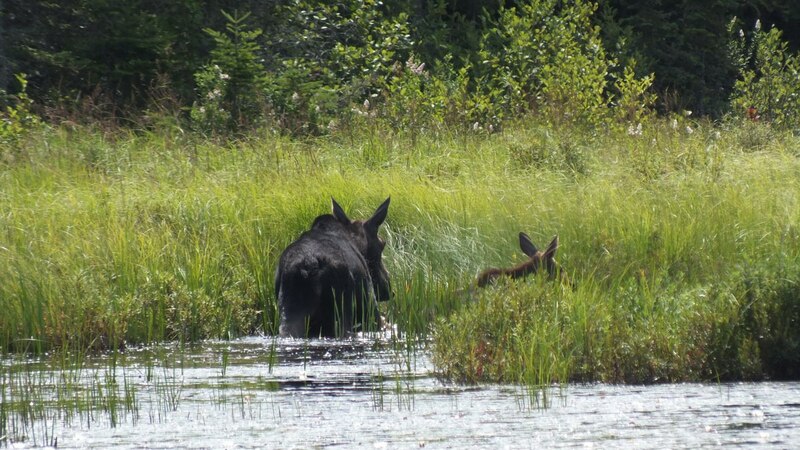 It was also obvious that the two Moose were trudging through water that was quite deep, up to the middle of the Cow’s ribs. 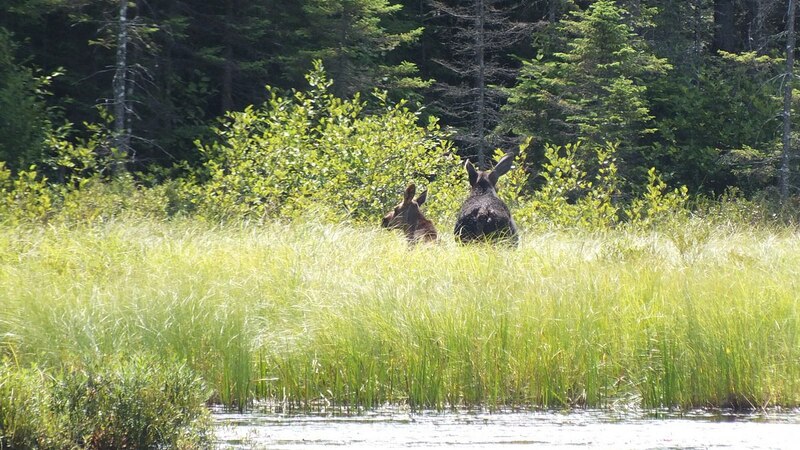 Moose routinely wade into rivers, lakes and marshes even venturing into water up to their shoulders in order to get at available aquatic plants. 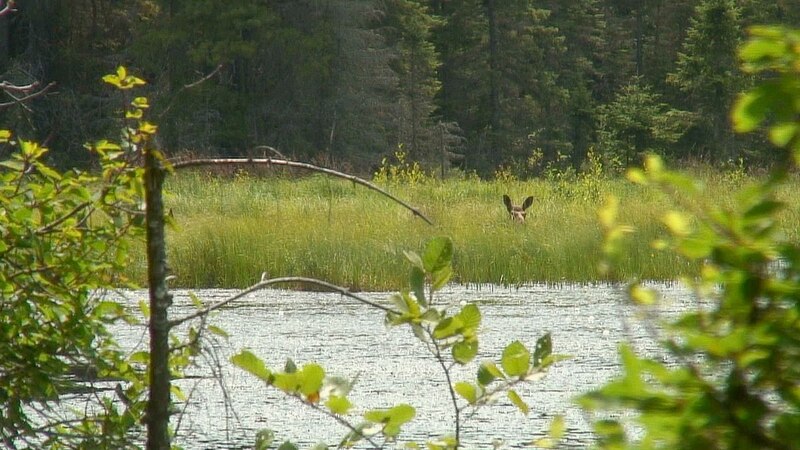 Water lilies, pondweed and horsetails are amongst the vegetation eaten, and represent about 50 percent of a Moose’s daily diet. They consume about 50 pounds (23 kg) of plants each day with the remaining half made up of lichen, bark, fresh shoots from willow and birch trees, leaves and other forest plants. 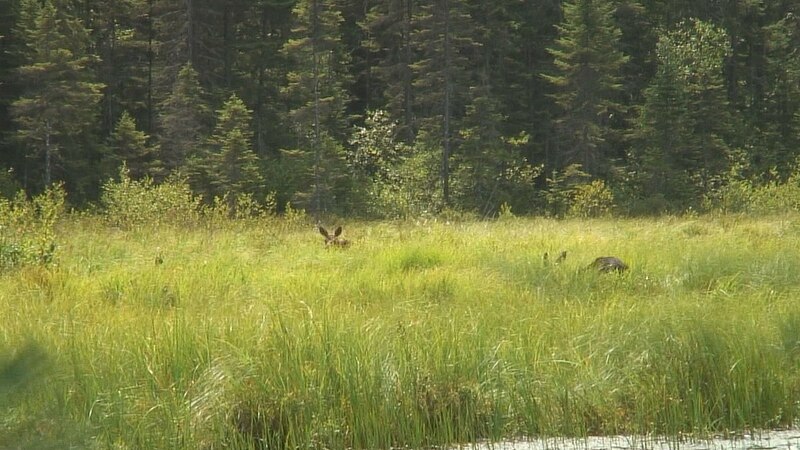 The reason that Moose eat aquatic vegetation is to make up for the lack of sodium in the other plant materials consumed. 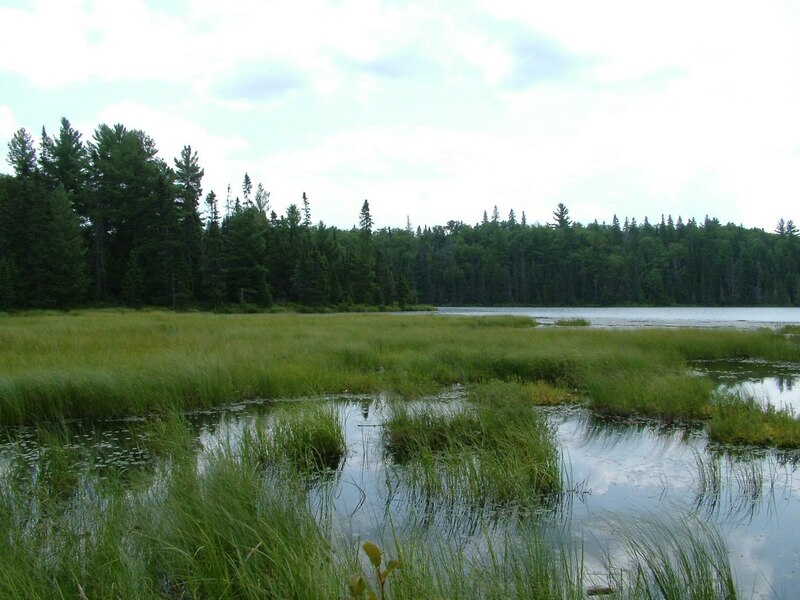 Aquatic plants, though lower in energy value, have a higher sodium content which is deemed significant to their diet. 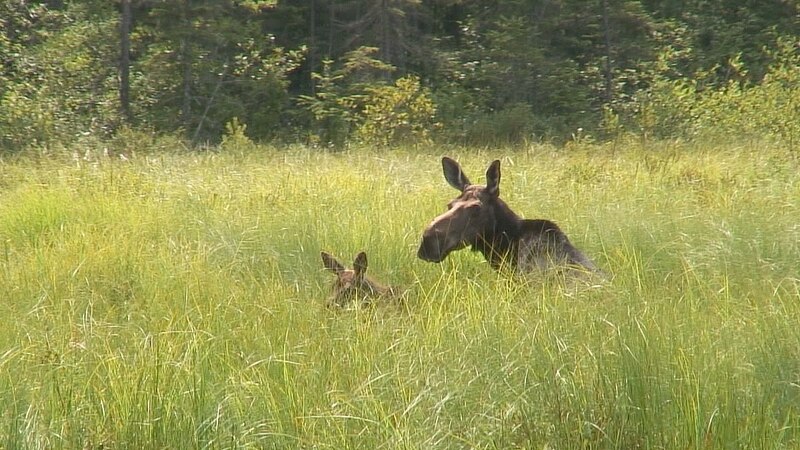 As I photographed the Moose cow and Calf, they started to move off to the right, perhaps sensing Bob’s presence on the trail closer to their own location. 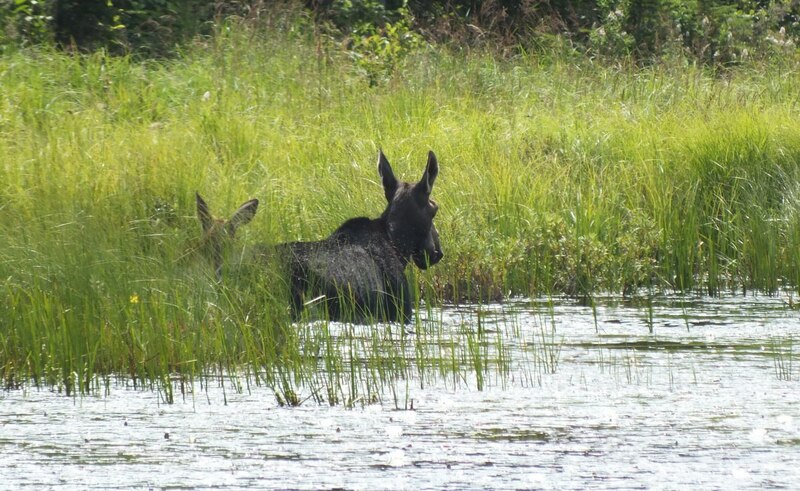 Moose are good swimmers and often are seen with only their heads showing above the surface of the water. They do not hesitate to submerse their heads if desirable roots or stems of aquatic plants are within reach, so they often vanish from view when they strive to grasp the plants they want. 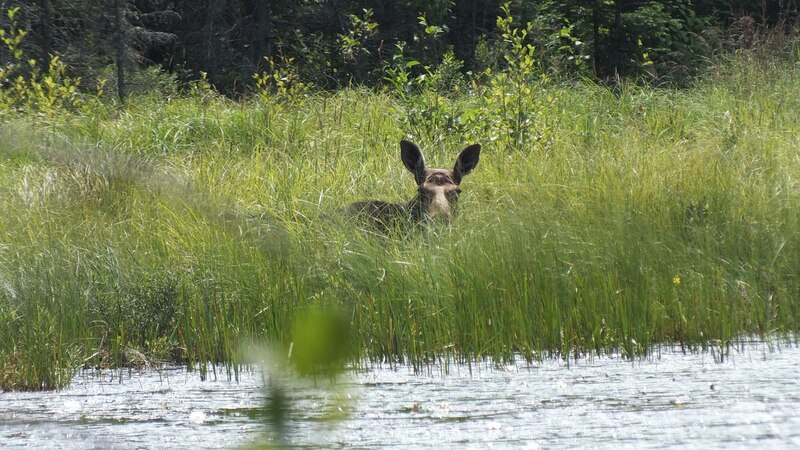 When the adult Moose moved to leave the area where she was feeding, she either stepped into a hole or a very soft spot on the bottom of the lake because her rump suddenly disappeared below the tops of the reeds leaving only her shoulders and head visible. In such a predicament, the Moose cow cast a wary eye in my direction. As I looked on, the Cow almost sunk out of sight, and I could sense her distress as she struggled to regain solid footing while the Calf moved nimbly away from her towards shore. With one mighty heave, the Cow succeeded in extracting herself from the bog’s firm grip, and she proceeded to follow her baby towards dry land. I could almost hear the suction of the mud when it released its hold on the Cow’s hindquarters. I think I had been holding my breath even as I rooted her on. while I turned my own attentions to catching up to Bob on the trail. 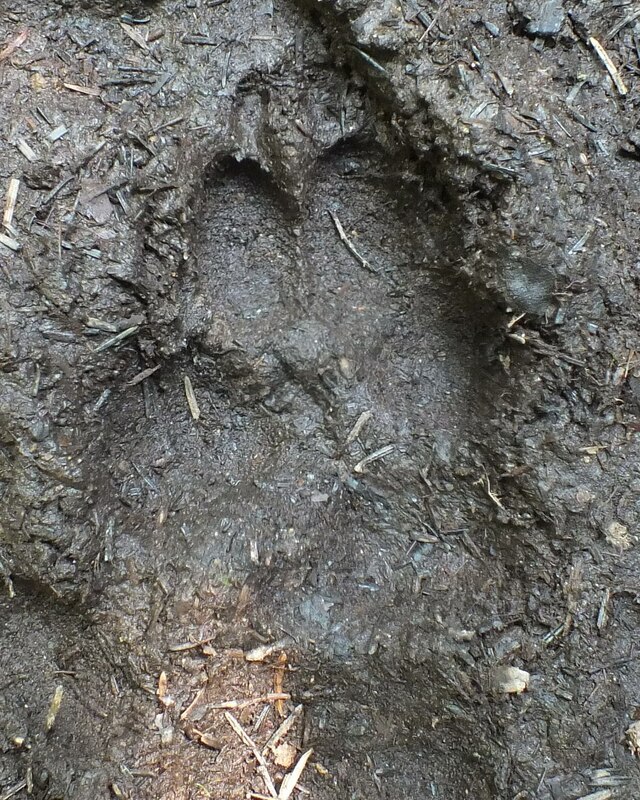 First, I had to tread carefully over a particularly muddy, slippery stretch of my own, and that is when I noticed the evidence of other creatures passing that way. was, what I judged to be a wolf track. Now, maybe that is just wishful thinking or maybe it was just a coyote track, but since dogs are forbidden on the Mizzy Lake Trail, I figure it had to be one or the other. I wasted no time catching up to Bob. 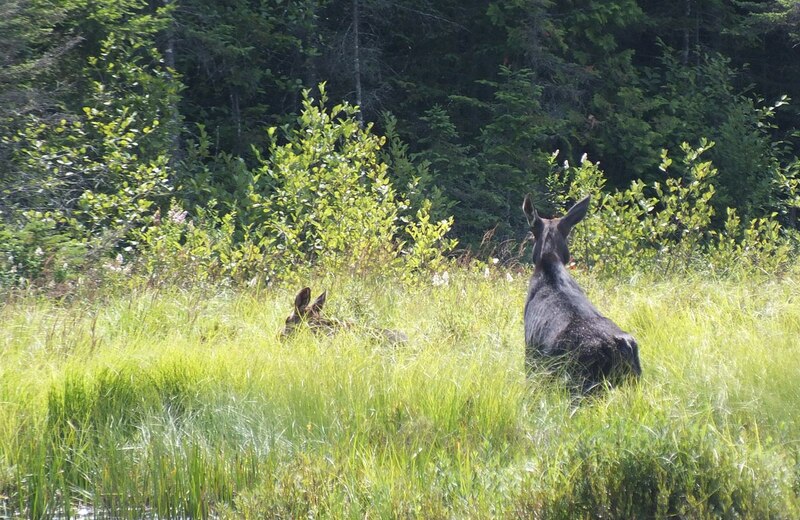 It was so much more exciting to come across Moose in the depths of the forest rather than seeing them along the highway corridor. We felt that we had earned the right to observe them as they went about their normal practices in the peaceful quiet of the woods. We saw a lot of interesting creatures and plants along the Mizzy Lake Trail and would highly recommend it to anyone interested in a good, long hike.